From The History of Beads, Concise Edition by Lois Sherr Dubin we learn that prayer beads originated with the Hindus in India followed by Buddhists in Tibet, China and Japan and Muslims in Persia and Arabia. Christians of the Middle Ages also used beads to count prayers. So today, nearly two-thirds of the world’s population use prayer beads. One can say human beings universally value beads as a spiritual necessity and jewelry accessory. For Elfcroft, collecting beaded accessories as taken priority over beading projects. Time to reconsider because I have a tsunami of inspiration. Yesterday, I went to the library to scan 35mm slides into jpeg files. The process is slow. I picked up the February 2012 issue of Bead and Button magazine (which I had never heard of). The number of resources is amazing. These are a few of the websites mentioned. 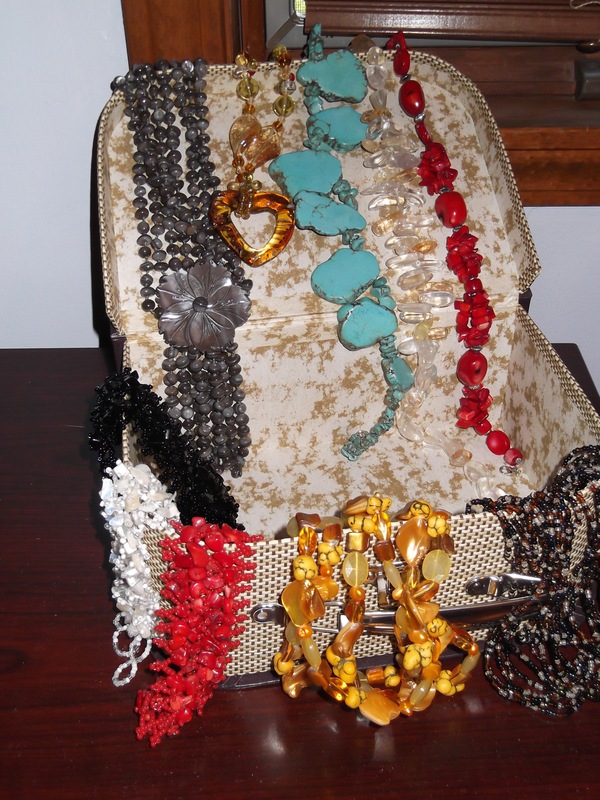 There was a great story about how agrainofsand.com acquired their inventory of vintage beads. Oh, you’ve got to stay away from the Bead and Button Magazine. It can get you in trouble!